Raise your hands if you use or have used Yahoo Photos. Even though I have been using Flickr, Picasa Web Albums & Photobucket for various needs lately, I still have a lot of my pictures left in Yahoo Photos. You might have read it here or elsewhere about Yahoo’s decision to shutdown Yahoo Photos. For those who haven’t, Yahoo bought Flickr a while back and is already one of the top players in this segment. Yahoo has decided to concentrate all its efforts in one application, which is wise. Now, it is official that they closing down on September 20, 2007. They are offering an opportunity to move your pictures to a smattering of services like Flickr, Kodak Gallery, Shutterfly, Snapfish and Photobucket. Here is an image from their help page announcing this closure. One thing to note here is that this deadline holds good for US Yahoo Photos users and international users have some more time until Yahoo phases them in. So, you have an optio to either move your photos to another service that is supported, or to download the pictures at full resolution, or you could buy an archive CD ($6.95 for 700MB of pics). 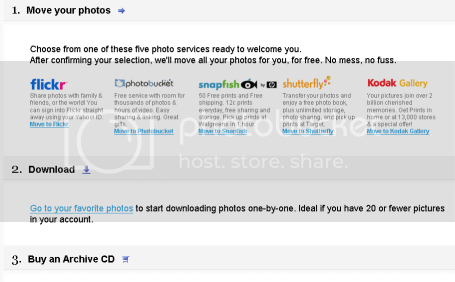 Since Yahoo Photos and Flickr are owned by Yahoo, this move is the easiest of all. Once you click on this URL, you will be presented with all 3 options. If you choose to move your pictures to Flickr, you could either sign up for a new Flickr screen name or Yahoo will detect your existing Flickr account. You will be shown a screen with a couple of photos from Yahoo and a message saying that the import process has started and that you will be notified when the import is complete! If you new to Flickr, give it a whirl and you will love the tagging, geotagging and commenting abilities which are definitely an upgrade from Yahoo Photos. But, that is just a peek into all Flickr has to offer. Have fun! I will see what I will do. That is going to be weird. There isn’t much still around that this old school Web 1.0 junkie used to use… I have quite a few Yahoo accounts that I am going to have to remember, access and pull photos from. I am not upset or anything… but it is just strange to see how much the Internet has changed over the years. It’s kind of link looking at an old aerial shot of your home town back from the 60’s and then looking at it now? I am suprised they just do not move the pictures over for everyone. Then send email with new link. I know a few blog sites that used to host photos and moved them to flickr they just moved them for members.